CrystalClear® KnockOut™ Plus - Airmax® Inc.
CrystalClear® KnockOut™ Plus is an all natural, fish treatment that eliminates plus prevents external single-celled parasites, ick and fungal infections. 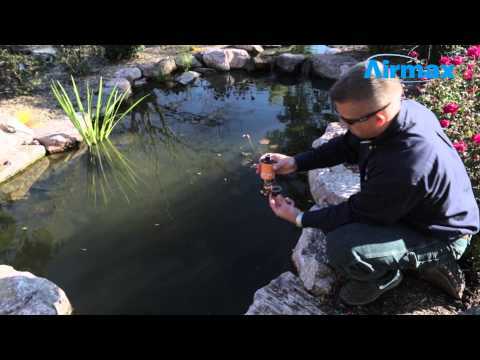 KnockOut™ Plus works extremely well with pond fish species such as koi and goldfish and unlike most fish treatments, there is no need to remove your filters before treatment. Furthermore, when used routinely, KnockOut™ Plus works as a strong preventative treatment. Use anytime new fish are added, during pond clean-outs, during spring start-up or any time fish are stressed. KnockOut™ Plus is a broad spectrum treatment for a variety of parasites including ichthyophthirius (Ick), sporozoan parasite, dinoflagellate infections as well as fungi such as saprolegnia, achlya, leptomitus and pythium. May be used with most invertebrates including snails. Shake well before using. For infections that last more than 7 days after standard application, treat twice per day. Apply once in the morning and once in the evening. Do not apply as a bath application. KnockOut™ Plus works best as an in-pond additive. Treat daily for 7 days anytime new fish are added, during pond cleanouts, during spring start-up or any time fish are stressed. Do not use other chemicals in pond while treating with Knockout™ Plus.